Stressed at work? Here are 5 ways to make the impossible, possible! Do you suffer from stress at work? Do you feel panicky when you see deadlines coming up that you haven’t met? 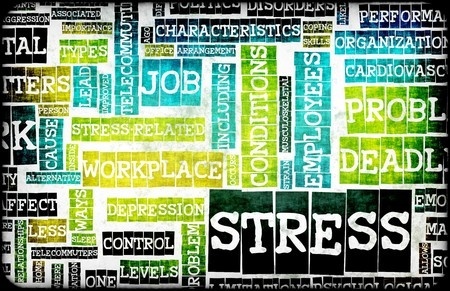 Workplace stress affects over 1 in 4 people, and if not treated, can lead to long term anxiety and panic attacks. If you really want to help yourself recover from stress, you firstly need to find coping mechanisms so when the going gets tough, you can get going. But why we do we stressed to begin with? Stress can be caused by many things, but the majority is usually a lack of support (emotional or otherwise) work related bullying or violence, and of course, work pressure. The thing is, work pressure takes place on a daily basis, but if you are unable to cope with the pressure, stress will be the response, and cortisol will be released (the stress hormone). You’ll find yourself having a headache, having a few pains here and there, maybe having palpation’s of a pounding heart, and a dry mouth…these are all symptoms of a stressed body, so it is vitally important to have coping mechanisms in place, so when you do get the expected daily work pressure, you don’t let it bombard you…you simply go along with the ride. Having been in a very pressurized environment myself, I knew about the daily pressures in trying to meet targets, and helping the company out. The only problems was that I had no coping mechanism, so I got stressed way too easily. And of course, if you get stressed, you are unable to focus so my targets suffered. This meant that I couldn’t switch off, ended up going home, and wasting hours trying to entertain myself in an attempt to relax. The only problem was then I went to bed late, had a bad nights sleep, and had to go through the whole saga again. It was a vicious circle, and all because I didn’t have a few coping mechanisms in place to help with the pressure. What most people don’t realize, is that if you don’t have your particular coping mechanisms, you won’t be able to build up confidence, which naturally helps increase your resilience to stress. This means that if you don’t get the help to overcome a stressful moment (and some people don’t), it will lead to adrenaline kicking in (the fight-or-flight response). If you still don’t get help even then, then it leads to subconscious behavior, so you will start to exhibit anxiety related psychological disorders, such as panic attacks, OCD, depression and so on. So how do you break this cycle, and lead a more mentally healthier lifestyle at work, when those targets just keep on coming? 1- Try to act, rather than re-act. Usually there is 50% of the workload which you have direct control over, and the other 50% can either take a long time, or could be challenging. The trick is to make the 50% which you control the best and quickest you can, so when you do come up against the inevitable 50% which you know is going to drag your day down, you won’t be too stressed by it. 2 – Learn to focus better by eliminating distractions. When it comes to a distraction/interruption, you can either accept the distraction, get rid of it, or try to find its importance, accept it and plan around it. Obviously you would need to think quick about this, but by doing this, you will be able to return to your busy work schedule and keep on being focused in meeting your targets. 3 – Saying the, ‘No’ word! Not every job will allow you to do this, but I included it here because it is a viable solution. By keeping your work manageable, your stress levels will be lowered. If you find you are being given way too much to do in the allocated time, learn to say the dreaded, ‘no’ word, but include a viable, practical solution. If you find that the work has gotten too much in such a short space of time, and you are unable to catch your breath, try belly breathing to help retain your focus and composure. Inhale through your nose for 4 seconds, hold, then breath out for 4 seconds through your belly. This will enable you to keep focus and keep that stress feeling down. Of course, getting your sleep and making your diet good are critical aspects of handling your stress. Don’t forget to get your 8 hours of good sleep and make sure you have a good diet. Without a good nights sleep, you are pretty much playing catch up on the word go. If you do find yourself having a bad night sleep, take time out to meditate or have a short 15 minute nap during a break-time, so you have some energy to go through the day. Hopefully the above will inspire you to take action and will hopefully reduce not only your stress levels, but also reduce and prevent any long term anxiety as well. Previous PostPrevious How to stop feeling that you are losing control in a panic attack! Next PostNext Panic attacks, mindfulness, and 3 ways to achieve it!